Associated Bank aspires to proactively reflect the diversity of the community within its workforce. To help the organization perform at its best, colleagues have dedicated themselves to attracting top young talent and helping that talent grow. 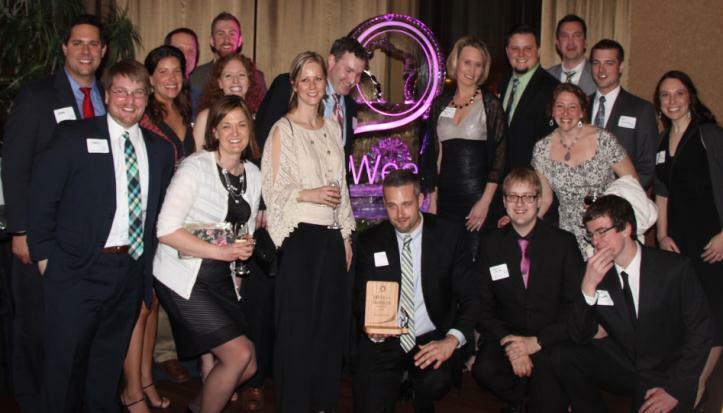 In recognition of these efforts, Associated was recently recognized as one of Wisconsin’s Best Places to Work for Young Professionals at the 2015 Bubbler Awards. The award was administered through NEWaukee, a Milwaukee-based firm that partners with the Young Professionals of Associated (YPA), a group at Associated that is committed to providing colleagues with career development, leadership development, education and networking opportunities. Winners were selected by a juried panel considering what Millennials are looking for in today’s workplace. “These awards shine a light on companies who have made great strides to accommodate the interests of a shifting workforce,” said Angela Damiani, president of NEWaukee. Unlike other workplace awards, the Bubbler Awards are specifically designed to highlight the voice of young professionals. Ben McCarville, marketing specialist and YPA member, with Lisa Knutson, HR communications business partner, took the lead together in crafting Associated’s nomination for the awards. “As soon as NEWaukee announced that they were accepting nominations, I knew it was something I wanted to be involved in,” said McCarville. The nomination and selection process builds the foundation for existing and up-and-coming young professionals throughout the state to collaborate and brand Wisconsin as a workplace destination for Millennials. The evaluation of the nominations focused on what young individuals are looking for in today’s workplace — competitive salary, benefits, opportunities for advancement, and colleague and community engagement.